Recently I wrote about trust, and what it looks like for my grandsons to learn to trust God by trusting me and my love for them. But, as I read in 1 and 2 Peter today I was challenged to think about what it looks like for grandparents to trust God. To really, sincerely trust Him. The world we live in is at times frightening. At other times there is a fair amount of uncertainty - we wonder what things will be like for our grandchildren as they grow up in a world which is increasingly moving farther and farther away from God. I know there is nothing more important to me than to be able to see my grandsons choose to love, know and walk with God. How could anything else be more important? It can be too easy for us to think no one cares as much as we do about our grandchildren choosing to love, know and walk with God; and may even think God does not care as much as we do. But nothing can be further from the truth. God does care. He cares the most; even more than we do. A simple, short, wonderful verse! I can give – or trust to – God all my anxiety, cares, concerns, because He cares for and loves me! And, He loves my grandchildren ever so much more than even I do! I need to make the choice to trust God with my most precious grandchildren – and is there anyone more trustworthy? Anyone who loves them more? Of course not! The second choice I need to make is to take my God-given responsibility seriously – I need to be an Intentional Christian Grandparent. Yes, I absolutely trust God, but this does not mean I just sit back, put my feet up, enjoy a glass of iced blueberry green tea and do nothing. No. Not at all. I have a God-given responsibility to pass on a heritage of faith to my grandchildren, so I will absolutely trust God with them and point my grandchildren to Jesus, pray regularly and faithfully for them and help them know and remember God! 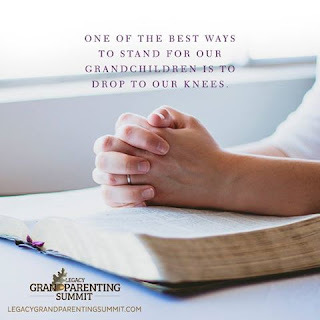 I have to say, it is a wonderful relief to know I can truly trust God with my grandchildren and experience the joy of being an Intentional Christian Grandparent – yes, both are very wonderful indeed!